I have to say I am really enjoying Sarah Alexi’s books, and having finished Black Butterflies, I have already purchased and dived into the next book of the series.I found the first half of this book a slow start compared to the previous two books by Alexi, but the second half more than made up for that. It has become apparent that the author takes a minor character from one book and gives them a staring role in the next – at least that seems to be the case so far. I find something rather comforting in this, as there is a feeling that the character is already known, and one is flitting around the village in Greece getting to know the people who inhabit it in depth, one individual at a time, as other new characters are introduced. I already have in mind characters that I would like to know more about, with the hope that they play a starring role in future books. A great concept for a series, and one that, combined with a lovely writing style, is keeping me reading on.If the books continue to pan out in the same way, I can easily see myself devouring the entire series.Four stars for this one, but still with plenty of the delights that pushed me towards five stars for The Illegal Gardener and Saving Septic Cyril. Marina is a middle-aged widow who, by accident, took over her late husband's shady business after his passing. She turned it into a successful shop which ensured her a modest living on mainland Greece. Her life was normal, predictable for more than twenty years, until her youngest daughter, Eleni, decided to join an island police team and settle there with her lover. Her oldest daughter, Artemis, was already married, living in Athens. Marina lived on the same island, thirty five years ago, and suddenly had to face her own dark secrets in an effort to prevent disaster for her daughter. She was forced to secretly return there and seek answers to the question that prevented her from maintaining normal relationships with the people around her. The road to healing and bonding was difficult and long, the challenges immense.Comments: It is a quiet, laid-back book, which reads easily and ends on a positive note. Well-written and plotted. It is a beautiful love story between mother and child. It is not a chic lit book, but definitely a gentle, endearing insight into the psyche of loves lost and found, with two unexpected surprises waiting upon the reader. The Greek islands is so well defined, both physically and culturally. I really enjoyed this relaxing, light-read with its deeper under-layers. The writing style is very much similar to Maeve Binchy.I enjoyed the experience. BeautifulSara is such an amazing author. I enjoyed the book so much that as soon as I was done reading it I wanted to start all over again. Having been born in Greece, I bought this book hoping to have found a series I could relate to and love. Unfortunately, this wasn't the case and I couldn't even finish the book.Although I have no doubt that Sara Alexi has a lot of talent - her descriptions of the island and Greek things in general are quite lovely - this book came off as a Greek/British Cozy. The pace of the book was eventual, and usually I'd say there's nothing wrong with that, but what kept the pace slow wasn't all that interesting.And what really turned me off was that every Greek character's dialog sounded as if they were all born and raised in England.i.e. "My body may be knackered but I am not crackers!" or "Yes, I think I could use a bit of a lie-down." Every time I came across one of those very British expressions they took me right out of the story, and some made me groan they were so very out-of-place. I think if Sara Alexi wants to write books about Greece she needs to forget she's English and write dialog that fits the setting of her books. Black Butterflies is closer to my kind of beach read than The Illegal Gardener, which I loved. They are different animals. The former, a sensitive look into the heart of a large problem: leaving your country to survive, and the latter, a suspenseful summer read full of Greek sunshine. It passes the time, treats you to a now familiar setting and gives you some page-turning suspense. I especially liked the opening with the rug salesman. I did miss the warm, deep sensitivity of the relationship between the main character and the houseboy in The Illegal Gardener, but really liked this book. Take it on holiday to the sun this winter. The second book in the Greek Village series. On par with Sara's first book. You immerse yourself in village life and begin to build a picture of all it's residents.Look forward to munger three. Probably the strangest reading experience in my life so far, thanks to other reviewers.Having thoroughly enjoyed “The Illegal Immigrant” I jumped at “Black Butterflies” and started reading immediately. I slogged through the first half not understanding what was going on (I am a bloke, a woman may have guessed) and not seeing any connection with the first in what I was told was a series. Eventually I gave up and my Kindle tells me I was 60% of the way through.I looked to see if other reviewers were as disappointed as me and found a number where the last half of the book was extolled as being descriptive, revealing, etc etc. including other things which could give the ending up.Picking up where I had left off was easy on the Kindle and I finished the book on the same day. Cried at the end which is difficult for a bloke to admit to and the tears took my review from a three star to a four.Immediate download of book four in the series “The Explosive Nature Of Freedom” to see where that will take me. I will probably read it in Spain, wishing I was in Greece. Another amazing book by Sara Alexi. She takes you into so many places...and I want to go there again and again. This was my second read by this author, "The Illegal Gardener" being the first....such a fantastic book that I thought Ms. Alexi couldn't repeat her success in any other piece of fiction so I was afraid to read another. After all, the next one would certainly be so much less and she would disappoint me. Well, I was wrong! She is such a talented author. I will most assuredly be reading every book that she pens! Sara Alexi's books immerse the reader in a behind-the-scenes Greece full of authentic details, and Grecophiles will find this a delightful read. I came to it after The Illegal Gardener, which I found more gripping, but this is nonetheless a clever and beautifully written gem of a book. A pleasant enough read - but disappointing after reading The Illegal Gardener. No surprises as to what the "secret" was. Good bookSara Alexi is one of my favorite authors. This book did not disappoint. It is a mother, daughter having trouble dealing with their relationship but a refreshing unexpected development made the book great in my opinion. It's always fun to take a trip to another part of the world and get to know its people from the inside. From the moment this story begins, we are transported to the islands of Greece and meet the people there. It is a slice of life you cannot get without buying a ticket, but this author tranports you there down to the whitewashed houses and little cafes on the beach with loving detail. Against this backdrop, we get to know a lonely, troubled woman and her children. I will not play spoiler here, but the pains of this lady's life, have deep roots and there is more to her than just a meddling mother. She has her reasons. In the course of her experience we feel her heartache and her joy and all on a little island steeped in personal history. Along the way she finds more than just answers, she also discovers that life is both the joy and pain of living. A sensitive, often touching tale with enjoyable characters and a few surprises. In spite of a somewhat slow start, I liked it. If you can't afford a trip to Greece, this is a pretty good alternative. Although I felt the first chapter was a little slow for my own personal taste I am so happy that I stuck with this book because I loved it. We follow the central character, Marina, whilst she struggles to deal with the secrets and lies that she has been living with for many years. I feel like I have been on a trip to Greece myself following Marina between islands. I found myself thinking about the story throughout the day, even when I wasn't reading the book. I also enjoyed the reappearance of Juliet from 'The Illegal Gardener'. Black Butterflies was an easy, enjoyable read that I would be happy to recommend to other readers. I will look forward to reading the third book in this series. 'Black Butterflies' is a gentle delight. The novel is infused with the sights, sounds and smells of the Greek islands, and Ms. Alexi transported me to the locations effortlessly. The detail in the writing immerses the reader in the Mediterranean culture: the atmosphere is artfully constructed.One of the aspects of the book I most liked was that the author took her time with the narrative, mimicking the daily rhythms of Greek island life itself.The tale is a straightforward one - the widowed Marina sets out to prevent her daughter Eleni from making a bad match - but the book is full of charm, acute observation and genuine emotion.I already have the next two books in the 'Greek Village' collection on my Kindle. I picked up Black Butterflies not too concerned that it was the second in the series; it did not seem to follow on and could be read separately. However so, after about halfway I was hooked on its beautifully descriptive narrative of the Greek islands and the colourful characters that reside there. So descriptive it was that, (especially during an English spring that refuses to spring into action) you could almost imagine basking in the sunshine and taste the Tzatziki on my tongue! Although the plot is quite simple, a quest to find her daughters love, it twists and turns in the all the right places and driven by the detailed description of the characters makes it a very interesting and entertaining read, now I have to backtrack and read the first in the series too! Very disappointed with this book. I had really enjoyed the first in the series (The Illegal Gardener) so was looking forward to revisiting the Greek village. However I found this second book incredibly slow. Alright, I understand that it is character driven, but there was little to hook my interest. I skimmed the last third or so just to see what happened. I will try the next in the series to see if the stories pick up again. This was the last book of the series I read....slowly to savor every word. Beautiful!! realistic, Sara delves so deeply into the characters leaving no emotion untold. Amazing and a new Island to imagine. So sad when it was over, I wanted more! I want to be there with these people, meet them, live with them, eat the food, experience this rare view of village life. Beautiful, and I am eagerly awaiting the next episode! Thank You Sara! This delightful companion to Alexi's wonderful "The Illegal Gardner" takes a lighthearted and then serious look at the harm keeping secrets can do. Highly visual and beautifully described, the book sweeps the reader into Marina's life as she tries to prevent what could be a family disaster. 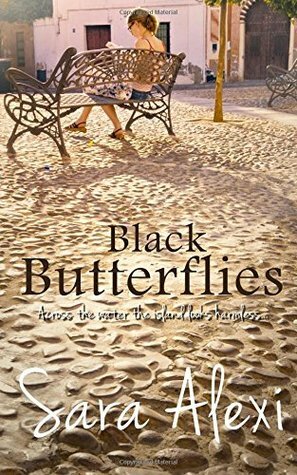 Black Butterflies would be a perfect vacation or beach book. Recommended. This is book two in Sara's Greek Islands series. She has a way with words that bring her characters to life, making you feel their pain and enjoy their happiness. She's also quite clever in exposing secrets. This is a great beach read but for me, it was such a page-turner, I read it in 2 days! Now on to book 3 in the series! I love this series of books and am slowly working my way through them - they are pure fun reading and great for sitting in the sunshine and just letting the world drift by. I like the way the author picks a minor character from a previous book and then links the next book into them, I am hoping book three will be just as much fun. I loved this book from start to finish and must admit to having to wipe a ter from my eye at the ending. Beautifully written and so evocative that you can almost feel yourself in Greece. Looking forward to the next in the series - great summer read! I read the Illegal Gardener and really enjoyed it but this one not so much. It seemed to plod along and for much of the book, I really didn't know what any of it was leading to and eventually didn't care. Sara brings this little village to life with their hopes and dreams and schemes. I love the characters and how we learn more about each of them and revisit the ones we already know. I have a desire to visit Greece that I have never had. I love this series! After reading and enjoying Sara's first book in this Greek series, I went on to read this the second one of the series, and found I enjoyed it even more than the Illegal Gardener! Great characters, funnny and moving too, now on to the next book!